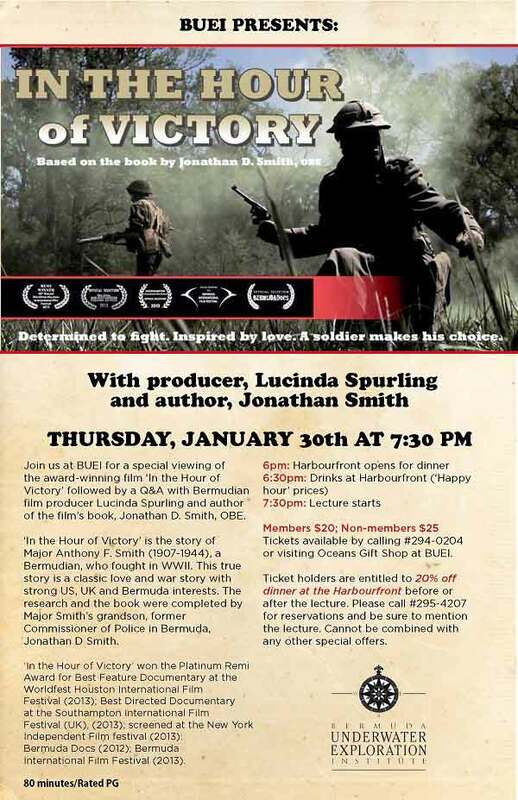 The Bermuda Underwater Exploration Institute [BUEI] is getting set to present a special viewing of the award-winning film In the Hour of Victory, followed by a Q&A session with Bermudian film producer Lucinda Spurling and the author of the film’s book, Jonathan D. Smith, tomorrow [Jan 30] starting at 7.30pm. In the Hour of Victory presents the story of Major Anthony F. Smith [1907-1944], a Bermudian who fought in World War II. Offering a true story in its narrative, this film is a classic love and war piece with strong American, British, and Bermuda ties. The research for both the film and the book were completed by Major Smith’s grandson, former Commissioner of Police in Bermuda, Jonathan D. Smith. In the Hour of Victory won the Platinum Remi Award for Best Feature Documentary at the Worldfest Houston International Film Festival, Best Directed Documentary at the Southampton International Film Festival, and was screened at the New York Independent Film festival, Bermuda Docs, and Bermuda International Film Festival, all in 2013. The BUEI special viewing of the film will begin at 6.00pm when the Harbourfront opens for dinner, with drinks served at happy hour prices starting at 6.30pm, and the lecture beginning at 7.30pm. The entry fee for members is $20; for non-members, the cost is $25. Tickets can be purchased by calling 294-0204 or by visiting Oceans Gift Shop at BUEI. Ticket holders are entitled to 20 percent off dinner at the Harbourfront before or after the lecture. Please call 295-4207 for reservations and be sure to mention the lecture in order to guarantee the discount; note that the discount cannot be combined with any other special offers.